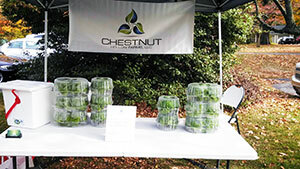 Chestnut Hollow sells hydroponic greens at farmers’ market. It is no surprise that Harold Blackwell launched his venture into commercial agriculture with a sound business plan. An investment banker by day, Blackwell started gardening outside as a hobby, something to do during his off hours to de-stress from the workday. But he could only take that so far in Connecticut, when outdoor gardening pauses during the winter. To solve this problem, he began with small pots of herbs grown indoors, and then expanded into a small hydroponics set-up. He was pleasantly surprised at the quality of his results, and after a few years had the fortune to meet a commercial hydroponics grower in Bridgeport who showed him the ways of growing hydroponically at a commercial scale for a living. So Blackwell and his fiancée, Sam Robinson, launched Chestnut Hollow Farms in 2013, selling hydroponically grown lettuce, leafy greens, and culinary herbs at farmers’ markets in Fairfield County and to local independent grocery stores. Although many vegetables can be grown hydroponically, Blackwell strategically decided to focus on the leafy greens because he saw a gap in the market. His hydroponics system started with a $150 16-square-foot custom-built system and has since expanded into a $3,000 system from American Hydroponics, a hydroponics supply and consulting firm. Blackwell is committed to reducing the impact of his production on the environment. For example, he turned towards ladybugs instead of pesticides when faced with an aphid invasion. His hydroponics system recirculates the water so none of the growing solution ends up in the watershed, and the growing solution itself is made from all-natural ingredients such as seaweed and kelp. This commitment appeals to his customers as well as his own sensibilities. Chestnut Hollow has yet to turn a profit, but Blackwell is confident in his business plan. He is already looking into expanding to meet demand. The Connecticut Department of Agriculture is trying to reach a goal of having five percent of food sold in grocery stores and restaurants to be grown within the state, so he sees a business like his as in demand to meet that need, especially since agricultural land in Connecticut is limited. Additionally, he says Fairfield County is filled with people who are committed to eating healthy, sustainably grown food, and they have the ability to afford such higher quality produce. Although Blackwell would like to expand his farm, possibly to include in-ground growing, he is still working a full-time job. This has been a blessing and an obstacle.